Hi Stacy Westfall, regarding Episode 36: Is there any ‘age limit’ or health concerns such as arthritis, that would cause you to refrain from teaching a horse to lay down, regardless of how much it may benefit the horse’ s attitude? I consider both the bow and teaching a horse to lie down to be advanced groundwork. This means that your basic groundwork should be very well established including teaching your horse to: lead, turn on haunches, turn on forehand, back up, trot in hand, lunge easily at all gaits, sack out with ‘scary’ objects, stand quietly while whipping with stick n string, etc. Teaching liberty work, working your horse without a halter or lead, should be in the same category as bowing and the lie down. By the time you have taught your horse all of the basic groundwork skills listed (and more) you should know your horses temperament very well. This will tell you a lot about how your horse is going to handle the process of learning to lie down on cue. 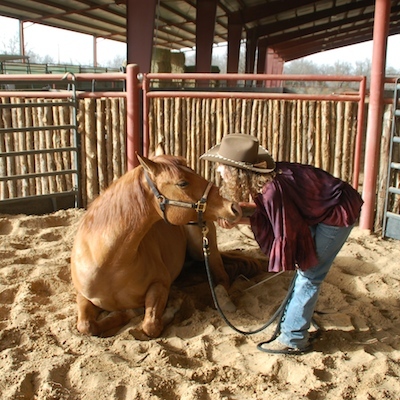 Naturally quiet and submissive horses tend to be the easiest to train. These are the horses that are fine with you walking into the stall while they are napping. Horses that are more naturally jumpy and nervous tend to be more difficult, which makes sense as they are often making plans on how to leave if things go bad. These horses can be taught to lie down but they require a very solid foundation in the basic groundwork skills. They should be so solid in the basics; whipping around, being sacked out, loping one circle on the lunge line and then standing like they are bored, that they should look like they are NOT hot or nervous. These horses also benefit from learning at least some of the basic liberty skill, off line in a round pen, as shown in Episode 14. I think that the idea that laying a horse down will change its attitude is largely a myth. I have seen horses that were forced to lie down with ropes and although some of them do get up with a shocked look, I have not noticed it to be a look that I want in my riding horses. I do think that the longer, slow process of teaching the lay down does have a positive effect as you will invest more time getting there. Someone asked me once how young a horse could safely be taught to bow (without force) and I asked a vet. His opinion was that young horses are more flexible and, as long as it wasn’t forced, would be excellent candidates. If I were working with an older horse I would only do what they were comfortable with. If your older horse has arthritis bad enough to negatively effect his ability to lie down on his own in the stall or pasture then I would personally choose to skip teaching that horse. Many vets recommend that horses with ‘some’ arthritis stay active. I have some arthritis and it is recommended that I also stay active. The best thing to do is to ask the vet who diagnosed the horse for their opinion regarding training the horse to lie down. ← Worst angles for horse photos…post your terrible photos here! I love you, and I honestly feel you have the horses best interest in mind. And I follow you quite a bit. BUT, why didn’t you release Jac in the lay down video sooner?? He honestly thought, in my opinion, that you wanted him to stand like that! I understand he didn’t give what you wanted, but his mind was there, and he looked so uncomfortable but stood like a champ!! I would have released my horse sooner. I couldn’t even watch. I know you must have a reason! Please explain?? I think I can see where you are coming from. Keep two things in mind. First, I was using this as an illustration of giving Jac a choice. He could make a choice. It is OK for there to be some difficulty involved. Jac may have been trying the wrong thing…but he was being allowed to experiment. I think it may have bothered you more because it was not something you were accustom to seeing a horse ‘try hard’ at, meaning if he had been loping circles, sweating and puffing (working harder than he was here) it would likely have been more acceptable. Jac wasn’t hurt. I promise.